Since the 31 July 2006 announcement by the Cuban government that octogenarian Fidel Castro had transferred power to his brother Raúl there has been increasing speculation regarding political and economic changes in Cuba. One key topic of particular interest to the international business community is the potential for investment opportunities in a post-Castro, post-embargo Cuba. Specifically, the subject of foreign direct investment (FDI) in a post-Castro Cuba has drawn extensive attention in business and academic circles. For the most part there seems to be a generalized belief that a post-Castro, post-embargo Cuba will result in a business bonanza for American firms. Analysts and observers note that after nearly fifty years of totalitarian rule and a command economy system, the island and its population of over eleven million are in desperate need of practically any product or service conceivable from capital goods to consumer goods. Following this main premise of observable need it is then concluded, almost as a syllogism, that American firms will rush to invest in a post-Castro Cuba. The caveats introduced to moderate the enthusiastic outlook that sizable foreign direct investments will follow a regime change in Cuba pivot on the effectiveness and the speed of the transition. That is to say, on the implementation of a market economy, a democratization process, the fostering of a law-based society, civilian values, an entrepreneurial class and the myriad other topics that constitute the enormous task of transitioning a society after nearly half a century of communist rule. However, the conclusion that significant levels of FDI will flow to Cuba is somewhat Calvinistic and seldom questioned. This paper seeks to examine more critically the ability of a post-Castro Cuba to attract FDI and to offer some policy recommendations to do so. A controlling idea of this work is to examine how the interdisciplinary body of knowledge developed in International Business Studies may contribute to our understanding of how multinational firms will evaluate the decision to invest in Cuba in a post-Castro milieu. This approach of examining Cuba’s potential for attracting FDI through the theoretical lenses of International Business Studies is a departure from typical assessments that rely almost exclusively on international macroeconomic tenets. That is, a departure from estimations based on abstract generalizations about aggregate corporate behavior. The specific intent of this work is first to assess Cuba’s potential for attracting FDI in a post-Castro era with an eye to the bodies of theory that focus on the individual firm. The work then turns to the potential role of Cuban-Americans as an FDI catalytic force. Before the desired end-state of a fully democratic political model and free market economics are in place, a post-Castro Cuba will undoubtedly go through a series of political and economic transitional scenarios and events. It is not the objective of this study to attempt to predict such transitional scenarios, but rather to assess Cuba’s potential for attracting FDI. Clearly, however, the FDI decision will be affected by the transitional dynamics and the perceived political and economic risks. In order to frame the discussion that follows, the theoretical overview will make the heroic assumptions that a future Cuban transition government is moving towards an effective democratization process—and not simply making a personnel change—and fostering the implementation of a market economy. To be clear, these are not predictions made in a quixotic flight of fancy. These assumptions are postulated to construct the argumentation based on a Cuban economic sector characterized by private enterprise and consumer sovereignty. The degree to which these assumptions hold will be pivotal to the FDI decision-making process. Therefore, the topic of transition-related political risks will need to be superimposed as events in Cuba and the U.S. unfold. Similarly, as noted in the opening paragraph, the work is anchored on a post-embargo Cuba. That is to say, it is a given condition that the Castro brothers are out of the picture, the U.S. embargo has been lifted, and U.S. companies are free to invest in Cuba. I will revisit this topic later in the context of recommendations for policy formulations. Finally, the work is focused not on opportunities for doing business with Cuba as a generic all inclusive label, but on FDI as a specific market entry strategy. In order to clarify this essential point, a brief overview of strategies for entering foreign markets is offered below. Typically, firms seek to mitigate risks in the international milieu by starting with low-risk/low-control market entry options and advancing to higher level of risk and control if beneficial to the firm and/or competitively necessary. Moving on a scale from low to high risk, international market entry strategies are often categorized under the headings of (1) exporting; (2) licensing and franchising (contractual arrangements); and (3) joint ventures and wholly owned subsidiaries (foreign investment). (Robock & Simmonds 1983, 50–62). Certainly, in a post-embargo environment, U.S. companies will want to export their goods and services to Cuba. From a corporate point of view exports (foreign sales) are in many instances the preferred entry method for a company to serve a market while minimizing business and political risks.2 American companies may also seek to “export” their goods, and particularly their services via contractual arrangements such as licensing and franchising. Given that there has not been a significant private sector in Cuba for nearly fifty years, opportunities for contractual arrangements of the licensing and franchising kind are likely to be limited to arrangements with government enterprises. That is to say, early on, U.S. companies will not find many private sector Cuban partners or a modern legal system conducive to sophisticated licensing or franchising contractual arrangements. For our present purposes, this genre of higher risk, higher control, market-entry strategies can be classified as the exporting of intangibles such as patents, trademarks, skill sets, technology and the like. Notwithstanding these limitations, I will revisit this mode of market entry later in the discussion of the potential role of the Cuban American community. Foreign sales by U.S. companies to Cuba, however, will not directly contribute the capital, technology transfers, and other desirable components of direct investments that will be so desperately needed in post- Castro Cuba. With these framing considerations out of way, the discussion can now turn to the central question of Cuba’s potential or ability to attract investments in the form of joint ventures or wholly owned subsidiaries; more specifically to whether American companies will rush to invest in a post-embargo Cuba. To answer this question we must first understand why firms engage in FDI in the first place. As elementary as this statement may seem, an understanding of what motivates individual firms to invest in a foreign country is often missing from the formulation of U.S. foreign economic policy. More often than not, U.S. policy makers (as well as their counterparts in other countries) when seeking to promote corporate FDI will introduce incentives around tariff issues, tax benefits and the like. Their policy-making tool kit is primarily based on international economic principles. While important, and perhaps even necessary, these incentives are insufficient to motivate corporate action. To put it bluntly, a firm will not risk to undertake an overseas investment in response to a tax-related incentive. Such an incentive may indeed impact the economic calculus of the firm and perhaps even tilt the balance in favor of an investment decision. But, it will not be the reason for the investment. For that we must look at the strategic considerations of individual firms in their competitive environment. The policymakers’ myopic approach is understandable since international business has existed as a formal field of study for less than fifty years since the founding of the Association for Education in International Business, later known as the Academy of International Business (AIB).3 Arguably, international business is now a distinct social science discipline with its own core theories, its own scope and level of analysis, its own cadre of social scientists, and its own literature. We will therefore examine how insights into corporate decision-making offered by international business studies may be used to assess Cuba’s potential to attract FDI. More importantly, we will use those insights to offer policy-making recommendations that may be employed both by the U.S government, and a future Cuban transition government if interested in attracting foreign direct investment to the island. Theories of foreign direct investment have long stressed the less-than-perfect competition associated with international investments. These theories reflect the presence of market imperfections, market disequilibrium, government distortions, and market failures. The available literature is vast and growing. A comprehensive review of this literature is outside the scope of this work and would detract from the Cuba-specific nature of the arguments. The general discussion will touch, and then only tangentially, on the firm-specific and location-specific concepts relevant to our central question. Resource-seeking FDI—to obtain supplies of natural resources such as petroleum, minerals, agricultural products, or tourist destination locations. Efficiency-seeking FDI—to establish feeder plants taking advantage of lower cost local production conditions to serve foreign markets. Market-seeking FDI—to supply local markets. In the first instance, resource-seeking FDI goes wherever the resources are found. An important objective of this work is to offer policy recommendations to persuade U.S. firms to invest in joint ventures or wholly owned subsidiaries in Cuba. However, when foreign direct investments are motivated by and geared to the extraction of scarce raw materials (or other natural resources) available only in selected countries, the policy formulation aspects investigated here may be trivial. This is not to suggest that a future Cuban government need not put in place investor friendly policies for this genre of FDI; it most certainly does. The taxonomy is introduced to differentiate between types of FDI and to evaluate which type Cuba may be able to attract, and how to go about it. A post-Castro, post-embargo Cuba committed to transitioning to a market economy and engaged in a democratization process will be able to attract resource- seeking foreign direct investments particularly in oil, nickel, agriculture, and tourism. Even under the very unfavorable conditions for FDI prevalent in the Castro era, some international companies have sought to invest in these industries. The objective here is to focus our attention on foreign direct investments where the firm has a choice of locating in country “A,” in country “B,” or in Cuba. That is to say, we will limit the analysis to resource-seeking and efficiency-seeking foreign direct investments. With respect to efficiency-seeking FDI, firms are generally looking to a location that offers the opportunity to lower production or distribution costs. The establishment by U.S. firms of manufacturing and assembly plants in China and Northern Mexico and elsewhere illustrate the process of searching for low cost production locations. Similarly, a strategically located facility in Central Europe may exemplify an efficiency seeking investment designed to lower distribution costs. The essential point is to spotlight that efficiency seeking firms are not compelled to locate in a given country. They are free to invest in a location that offers the opportunity to maximize efficiencies. With a plethora of low-cost countries around the globe that firms can chose for an efficiency-seeking facility, it is unlikely that Cuba, all other things held constant, will be able to attract this type of investments. The Cuban workforce, after almost five decades of operating under a command economy system, is ill equipped for the demanding labor requirements of a market economy. In the early years of a transition the Cuban labor force can not be expected to possess the work ethic and discipline necessary to offer a comparative advantage over other locations. In short, comparatively speaking Cuba does not offer U.S. companies seeking lower labor costs a compelling reason to invest in the country. Cuba does possess a highly educated labor force that may present cost advantages in certain industries requiring a specific scientific or technical expertise. Analogously to the way some U.S. software firms have relocated a significant portion of their programming work in India and elsewhere, Cuban technicians may offer cost saving opportunities in biotechnology, and other scientific and technical fields. The policy challenge, however, will be to motivate these scientists and technicians to remain in Cuba once they have the opportunity to seek employment in the developed countries. Given the emigration patterns of the Castro era, and the economic and professional opportunities available outside Cuba, it is easier to foresee a “brain drain” exodus from Cuba that it is to predict U.S. firms establishing technical facilities in the island. It does not necessarily follow, from the fact that Cuba possesses a well educated workforce, that U. S. foreign direct investments will take place to take advantage of Cuban technical skills. For U.S. companies, a much lower-risk strategy will be to recruit in Cuba for the skill-sets they require and relocate the personnel to the U.S. or elsewhere. For instance, in certain fields such as nursing, U.S. health care facilities are well known for sophisticated worldwide recruiting efforts. In terms of market-seeking FDI, Cuba, with a population of over eleven million and in great need of practically any product or service, may appear to offer a meaningful market. But neither need, nor size do a market make. First, Cuba represents an impoverished market with minimal disposable or discretionary income. Second, when compared to the populations of China, India, Mexico, Brazil, and many other large countries, Cuba’s market size does not make a compelling case for location of market-seeking FDI. We must keep in mind that firms have many location options and, it would make more economic and strategic sense to invest in a much larger market than Cuba for market-seeking reasons, ceteris paribus. Third, even in absolute terms, Cuba’s population is inadequate to support investments in production facilities for products that require a much larger consumer base in order to achieve the necessary economies of scale such as automobile production. Recall here that we are discussing investments geared to satisfy the needs of the local market (marketseeking FDI). Production for export to other markets will have to include efficiency-seeking or resourceseeking factors discussed earlier and requires a separate treatment. Fourth, production in a Cuba-based facility will have to rely on the import of many, if not most, of the components and parts required in the production process as few will be available from Cuban production. Businesses will have to anticipate that, notwithstanding Cuba’s proximity to the U.S., significant transportation costs for components and parts may mitigate savings in other areas. Finally, and perhaps most importantly, U.S. companies, if able to export their goods to Cuba, will elect exports as a much lower cost and lower risk market-serving strategy. In other words, we may observe an acute need for, say T.V. sets in Cuba, but it does not follow that U.S. companies will rush to invest in a T.V. manufacturing plant in Cuba to satisfy that need. They may simply export T.V. sets to the island from their Mexico manufacturing plant. From the vantage point presented above, there is no reason to believe that U.S. firms will rush to invest in a post-embargo Cuba. This remains the case even if we postulate a best case scenario where a smooth democratic and market based transition is taking place and the Cuban government is policy-friendly towards foreign investors. Given this discouraging outlook, what steps can be taken by a future Cuban transition government interested in attracting FDI and a U.S. administration wanting to encourage American companies to invest in a democratic Cuba? A starting point is to recognize that historically, policymakers have greatly overestimated the role that trade policy and tax credits play in the foreign direct investment decision-making process particularly in the case of small country markets. To assert that investment incentives are needed is to state the obvious. Those incentives, however, must be based on a more sophisticated understanding of the factors that lead U.S. firms to invest overseas. In typical economic language we may speak of U.S. exports to China or U.S investments in Brazil. This language obscures the fact that, in free market economies countries do not export, or invest, companies do. Policymakers in Cuba and the United States need to spotlight the competitive forces that energize market economies and not the taxation and tariff issues that are only of marginal consideration in corporate board rooms. The theoretical underpinnings of the statement above reflect a switch in attention from the act of foreign direct investment to the institution making the investment. This shift from act to actors corresponds to the theories of the multinational firm. Stated differently, the policy formulation emphasis needs to shift to the strategic choices of the firm. For our purposes in offering policy formulation recommendations and in the sense that “nothing is quite as practical as a good theory,” 5 John H. Dunning’s attempt at a theoretical synthesis is particularly helpful. (Dunning 1979). The firm possesses net ownership advantages visà- vis firms of other nationalities in serving particular markets. These ownership advantages largely take the form of the possession of intangible assets which are, at least for a period of time, exclusive or specific to the firm possessing them. Assuming condition 1 is satisfied, it must be more beneficial to the enterprise possessing these advantages to use them itself rather than to sell or lease them to foreign firms, i.e., for it to internalize its advantages through an extension of its own activities rather than externalize them through licensing and similar contracts. Assuming conditions 1 and 2 are satisfied, it must be profitable for the enterprise to utilize these advantages in conjunction with at least some factor inputs (including natural resources) outside of its home country; otherwise foreign markets would be served entirely by exports and domestic markets by domestic production. “Ownership-specific advantages” associated with condition 1 are based on industrial organization theory, where the emphasis is on competitive advantages flowing from product differentiation, brand names, marketing skills, management know-how, patented technology, economies of scale, barriers to entry, and the like. These advantages are specific to the firm. Condition 2 is covered by property rights, internalization6 and appropriability concepts. Location and trade theory (comparative advantage) help explain the third condition. Taking a policy orientation, Dunnings’s approach highlights that the FDI decision is based on more than cost considerations. Thus a policy formulation that seeks to promote a specific pattern of FDI—such as U.S. foreign direct investments in Cuba—must address the ownership-specific, location-specific and internalization- specific advantages that will be weighted by corporate strategists and decision makers. To this point, the discussion has sought to highlight the panorama of foreign involvement issues weighted by corporate decision makers. Next we will try to apply these concepts in the context of FDI policy formulation. Putting aside for the moment the political feasibility of any particular policy formulation, let’s begin the consideration of policy options with the classic export-oriented trade theory approach of duty-free market access. Clearly, duty-free access to the vast and affluent U.S. market for Cuba-based enterprises, regardless of ownership, needs to be a key policy consideration. For Cuba-based enterprises (existing or potential) the integration of their productive capacity into the world economy is necessary to attain economies of scale. But access alone will not be nearly enough. Domestic enterprises in the Caribbean Basin have experienced considerable difficulties in reaching foreign markets. Simply put, selling to world markets requires market knowledge, marketing expertise, and marketing finance. Just as importantly, successful exporting requires political muscle to overcome the protectionist forces in the developed markets. In the case of domestic Cuban companies which would lack these elements, market access becomes a necessary but insufficient condition. Exporting is made easier, cheaper, and generally more successful if there is an assured “captive market” for at least part of the production that is to be sold in world markets.7 With this in mind, the involvement of U.S. firms in post-Castro Cuba must not be conceived by Cuban authorities only as a source of capital and technology. It is also essential for Cuban policymakers to view U.S. firms, in a conceptually sophisticated fashion, as providers of access to world markets. It is one thing to conclude that the involvement of U.S. firms is important, and quite another to figure out how to attract foreign direct investments to a post- Castro Cuba. As argued above, Cuba, outside of resource- seeking investments, has relatively little to offer in terms of comparative advantages to attract foreign direct investments. What can be done? In the argument being developed here, the principles of business strategy are pivotal to the effectiveness of foreign economic policy since “the design of international [business] strategies is based upon the interplay between the comparative advantages of countries and the competitive advantages of firms.” (Kogut 1985, 15) Comparative advantages (location-specific) influence the decision of where to source and market. Competitive advantages (firm-specific) influence the decision of what activities and technologies a firm should emphasize (i.e., invest in) relative to other firms in the industry. Competition in international markets is a combination of both competitive and comparative advantages. In addition, a paramount strategic element in the corporate search for a favorable competitive position in an industry is the sustainability factor. That is to say, the search for a sustainable competitive advantage. The strategic value of a competitive advantage depends on its sustainability. In turn, sustainability exists if competitors find it difficult to replicate or imitate the sources of a firm’s advantage. An advantage is sustainable if there are barriers to entry that prevent competitors from matching its source. (Porter 1985, 97) I want to emphasize the related point that the competitive advantages of firms may be used to overcome or compensate for the comparative disadvantage of a country location, i.e., to compensate for Cuba’s comparative disadvantage in attracting FDI. Given this discussion, notice that, from the strategic perspective of firms, the classic export-oriented trade theory approach of duty-free market access discussed earlier does not offer firms a sustainable advantage. Even if firms perceive a Cuba FDI advantage due to duty free access to the U.S. market, the advantage may be readily imitated by other firms and thus nullified. Duty-free access does not tender first-moving firms the possibility of gaining a sustainable competitive advantage. First-moving firms seek sustainable advantages such as a preemptive position; a unique channel selection; a proprietary learning curve; favorable access to facilities, inputs, or other scarce resources; institutional barriers; and the like.10 In fact, given that earlier commitment is usually riskier than latter commitment, first moving foreign direct investors in Cuba face substantial pioneering costs and the risk that conditions will change. Without barriers or the opportunity to create them, firms in a fluid Cuba setting have little reason to disrupt the industry’s competitive equilibrium via a FDI commitment. In the absence of a competitive threat, the more likely strategy is to preserve flexibility by postponing commitment. Therefore, a principal objective of a policy designed to attract FDI to Cuba needs to be to provide U.S. companies the opportunity to gain a substantial competitive advantage if production is shifted to Cuba. In part, this may be accomplished through a creative package of tax exemptions, deferrals and other incentives. This package can be made much more generous and potent if it targets investments that promote the marriage of U.S. capital, technology, and marketing expertise with Cuban resources to make products more competitive in world markets. It must be noted that the focus is on production for world markets. This export orientation would be much more politically agreeable to the U.S. Congress. Second, and this is the key provision, this competitive advantage package would be available only to those U.S. firms that have established a production facility in Cuba by a given date—say within two or three years after the embargo has been lifted. The idea behind this provision is to utilize an institutional entry barrier to provide sustainability to first-moving firms. The plan thus shifts the attention and the rewards to first-moving firms that invest by the given sunset date. Under this plan first-movers would gain a substantial and sustainable competitive advantage over competitors that choose not to invest. There would now be a strong incentive to disrupt the industry’s competitive equilibrium. But this design does more than to address the preoccupations of first-movers. In this environment, a Cuba-based facility becomes a “compelling competitive necessity” (Kujawa 1982–87) in order to avoid a disadvantageous position. The fear of allowing a competitor to gain an enfranchised or monopolistic position is a very powerful inducement to invest. Strategically, no firm is willing to allow its competitors to gain an unchallenged monopolistic advantage. Firms respond to competitive threats by investing in new competitive advantages. In the environment created by this policy design, there is a competitive urgency to invest by the sunset date. Policy-wise this is strong medicine. But realistically, Cuba has little to offer to attract the desired levels of efficiency-seeking and market-seeking FDI. As suggested earlier, the business concepts of competitive advantage may be used to overcome location disadvantages provided that sufficient proprietary advantages can be developed. For Cuba, this policy design does just that. More than a concrete proposal, the approach I am presenting seeks to offer a new policy formulation focus. The approach spotlights opportunities and threats that are firm-specific rather than location-specific. The idea is simply to energize competitive forces. To this point the work has sought to show that the theoretical core of international business studies offers insight to corporate decision-making that can be used in government policy-making on both sides of the Florida straits to promote foreign direct investment in Cuba by U.S. firms. A geomanagement orientation is not a solution; it is a powerful analytical tool that needs to be included in the Cuban policy-makers tool kit. Additionally, a post-Castro Cuba will have access to an exceptional geomanagement country-specific comparative advantage that is the subject of the next section. To a poker player, the expression an “ace in the hole” signifies an opportunity to turn failure into success—a hidden advantage or resource kept in reserve until needed. To a post-Castro Cuban transition government seeking to attract U.S. FDI, the Cuban-American community represents its ace in the hole. Consistent with the thematic core of this work, the Cuban- American community is presented in this section as a comparative advantage for the island and as a competitive advantage for those U.S. firms employing Cuban- American executives. It has become somewhat politically incorrect in Cuban exile circles to advocate for a high profile Cuban- American role in the transitional policy-making period. As the argument goes, the future of Cuba must be decided by Cubans currently residing on the island who are most familiar with the current state-of-the country and not wedded to a romanticized recollection of pre-1959 Cuba. Additionally, the motives of Cuban-Americans may be suspect; there is a perception of an opportunist carpetbagger syndrome and more. Fair enough. The flip side of this argument is that Cubans residing on the island have been educated by, and lived under, Marxist doctrine and have not been exposed to modern Western managerial techniques. In short, from an international business competitiveness point of view, this population is managerially unprepared for the complexities and competitiveness of today’s global economy. This is not to attack the business competency or capabilities of the island’s population. There is no reason to believe that the Cuban population residing on the island does not share the strong entrepreneurial tendencies that have characterized the Cuban-American community. In fact, whenever given the opportunity, and in black market conditions, Cubans on the island have embraced self-employment and entrepreneurial activities. But these informal micro-business activities do not prepare a population for the managerial challenges of running a successful, internationally competitive enterprise. I want simply to point out that Cubans residing on the island have not had an opportunity to develop the sophisticated managerial skills-sets necessary to be successful in a highly competitive global market economy. The Cuban education system has not emphasized training in functional business disciplines such as management, accounting, finance, marketing, and others. Just as importantly, Cubans, living in virtual isolation, do not possess the extensive personal networks of business acquaintances that facilitate international business operations. Even under the most favorable transitional scenarios, it would be unrealistic and irresponsible for Cuban policy-makers to assume that this population that has lived and worked outside the requirements and demands of a contemporary market economy can unassisted bring about a successful integration into world markets. I say irresponsible, because whatever animosity a future Cuban transition government may harbor for Cuban-Americans needs to be set aside to access the extraordinary skills-sets of the Cuban American community. 2. Cuban-American executives working in large national and multinational enterprises. This dichotomy is seldom made, but it will prove to be instructive in the discussion that follows. Also, my focus will be limited to within my professional orientation in international business management. Clearly, essential transition roles may be performed by Cuban-American politicians, lawyers, social scientists, educators, academicians, scientists and professional in practically all fields. Very thoughtful and creative work geared to help bring about a successful transition is being carried out by Cuban-Americans and others in academic centers such as the University of Miami’s Institute for Cuban and Cuban-American Studies, Florida International University’s Cuban Research Institute as well as by private organizations such as “The Cuba Study Group.” The broader contributions of Cuban- Americans in transition topics such as institution building, legal reform, commercial and investment banking, educational reform, privatization of state enterprises, property rights, reconstruction, and many more will be invaluable, but fall outside the scope of this work and the writer’s international business professional orientation. Let us return, then, to the strategic relationship between geography-based comparative advantages and managerially-based competitive advantages. For a post-Castro Cuba, the capital and skill sets of the Cuban- American community represents a comparative advantage unlike that of any other country competing for U.S foreign direct investments. For U.S. firms, the presence of Cuban-American executives in their corporate organizational structure amounts to a significant competitive advantage: “Cuban-Americans … could accelerate the establishment of commercial and economic linkages between the U.S. and the Cuban economies and facilitate the island’s integration into world markets.” (Díaz-Briquets and Pérez-López 2003). In terms of international business theory, to operate successfully in a foreign market, a firm must possess sufficient compensating advantages to overcome the innate disadvantage of foreignness. Cuban-Americans, for the most part, will not be hindered by this disadvantage of foreignness. Moreover, for Cuban-Americans, the FDI decision-making process will not be strictly guided by the economic rationality models described earlier. To put it in finance terms, the “hurdle rates” for Cuban-American FDI in Cuba will be significantly lower, and the investment will be based on a different risk-reward analysis. In other words, Cuban- Americans will seek to invest in a post-Castro Cuba for reasons totally unrelated to the resource, efficiency, and markets seeking motives. FDI in Cuba undertaken by Cuban-Americans should not be conceived of as entirely foreign. What is more, Cuban products can find their way to world markets via channels of distribution readily available to Cuban- Americans. A unique aspect of this interaction is that it will not be handicapped by the inherent cultural disadvantages of foreignness just noted above. Another feature of these Cuban-American investments will be a much higher propensity to reinvest profits in Cuba. Come to think of it, for these Cuban-Americans the business expression of “profit repatriation to the home country” becomes an ambiguous term. In a perverse definitional way, FDI undertaken by Cuban-Americans in Cuba could itself be understood as the repatriation of profits earned by Cuban nationals in the U.S. “foreign” market. These investment activities will be overlaid by an unparalleled level of transnational commuting; not just tourism or business travel, but shuttle commuting with Miami as the hub. The commuting I envision is not of the usual home-to-workplace genre. For many professional and entrepreneurs in the Cuban-American community, it will be more like commuting from work-home place number one, to work-home place number two. For example I can foresee a Cuban- American owner of a small business in Hialeah investing in a Cuban “branch” to be run by his Cuban cousin in Santa Clara, with the Cuban-American commuting frequently to oversee operations, offer advice, bring supplies, and the like. In addition, as noted by Díaz-Briquets and Pérez-López (2003): “Particularly during the transition, business networks between the Cuban-American community and the counterparts in Cuba could help overcome informal barriers that inhibit trade, such as weak enforcements of international contracts and inadequate information about trading opportunities.” Picking up on this theme, in my earlier discussion of entry strategies I noted that early on, U.S. companies will not find many private sector Cuban partners or a modern legal system conducive to sophisticated licensing or franchising contractual arrangements. However, a Cuban-American businessperson will be much more amenable to enter into a formal or informal contractual arrangement with a Cuban partner than say, a large publicly traded U.S. company. Much can be said about the potential contributions of these Cuban-American entrepreneurs that have transformed the economies of South Florida and other communities throughout the United States. But there is another segment of the Cuban- American business community that is often overlooked in these discussions. We turn to this segment next. I suspect Cuban-American executives can be found working in large national and multinational enterprises in practically all industries. Some in top management positions such as Chief Executive Officers, and Chief Financial and Operating Officers; others in middle management and technical positions. The search for a comprehensive explanation for foreign direct investments is being advanced in various disciplines and along many lines of inquiry. For instance bargaining theory (focusing on power relationships) and motivational approaches emphasizing a precipitating or triggering factor as it relates to the FDI decision making process. Other more psychologybased FDI approaches focus on the individual executive as the central unit of analysis. For our purposes, it will suffice to say that in business, “someone has to make something happen.” Someone has to carry the flag for a particular project. Someone has to persuade other executives of the wisdom of a given course of action. In short, someone has to be a “champion” within the corporate structure advocating for and in support of a project. This is precisely the role I foresee for Cuban-American executives working within the corporate world. They will “carry the flag” within their organizations for a Cuban FDI venture. It is hard to overestimate the immense value of this capability. To have perhaps thousands of sophisticated and respected, Cuban-American executives arguing forcibly within their multinational companies for foreign direct investments in their country of origin is unprecedented in international business history. For U.S. companies, this bi-cultural executive capability represents a competitive advantage. Just as importantly, for Cuba it represents a comparative advantage, as no other country possesses such a national executive presence in corporate America. In my earlier generic and theoretical discussion of firstmovers, I highlighted that they face considerable pioneering costs and offered some policy recommendations to reward first-movers with a substantial and sustainable competitive advantage. In their discussion of Cuban-American as first-movers, Díaz-Briquets and Pérez-López (2003) offer that: “As investors who enter the Cuban market early in the transition, by their presence and example, they could change market expectations and advance the flow of foreign direct investment from more conventional sources.” I want to expand on this observation by noting that the role of Cuban-Americans as first-movers is not limited to the activities of Cuban-American entrepreneurs owning small and medium size businesses. It should also include the activities of Cuban-American executives working in large national and multinational enterprises who can act as “corporate champions” to motivate their employers to be first-movers. Furthermore, it is interesting to point out that in oligopolistic settings; firms are interdependent in that they are very sensitive to the competitive moves of other firms in the industry. In an oligopolistic situation, not to respond to a rival’s move risks the loss of market position or growth to the rival firm that initiated the competitive move.14 This oligopolistic reaction was empirically identified by Frederick T. Knickerbocker (1973) as motivation for the FDI follow-the-leader behavior observable in some industries. In other words, Cuban-American executives working in large national and multinational enterprises will have persuasive arguments in support of a foreign direct investment in Cuba if such an investment can lead to a substantial and sustainable competitive advantage for their firms. I argued above that Cubans residing on the island have not had an opportunity to develop the sophisticated managerial skills-sets necessary to be successful in a highly competitive global market economy. I have also called attention to the cosmopolitanism of Cuban- Americans and their potential as a global scanning force for needed products, markets and resources. This cosmopolitanism came about as a result of nearly fifty years of living and learning outside Cuba. Similarly, during the Castro era, hundreds of thousands of young Cubans were sent by Castro’s government to study and work in the former Soviet Union, Eastern Europe, the Middle East, Africa and other regions. These Spanish- speaking professionals are often fluid not only in English, but may also be fluent in Russian, German, Czech, Slovak, Hungarian, Serbo-Croatian, Slovene, Bulgarian, Albanian, and other Eastern languages.15 This segment of the Cuban population is, without doubt, the largest pool in our Hemisphere of Spanishspeaking technicians and professionals intimately familiar with Russia and Eastern Europe. They may possess a type of cosmopolitanism in terms of the former socialist block countries similar to that of Cuban- Americans with respect to Western countries. This Cuban population embodies a valuable asset to all countries and businesses in the Western Hemisphere. For instance, generally speaking, U.S. firms cannot identify business opportunities in Eastern Europe as fast or effectively as West European firms. For Latin American firms wanting to explore opportunities in Eastern markets, the obstacles are even greater than for U.S. firms. The second language skills of Latin American executives consist mostly of English, French, or other Western European languages. There are simply not many Spanish speaking executives whose second language is Russian or Czech, or who have business contacts in Poland, Hungary, or Romania. The Spanish- speaking Cuban population familiar with Eastern countries and languages offers an ideal link between Latin America and the emerging market economies in the East. Cuban-Americans are the natural business connecting point. The synergy of the Western cosmopolitanism of Cuban-Americans and the Eastern cosmopolitanism of those residing in Cuba can become a useful business development competitive advantage for all parties. The first section of this paper offered a rather disheartening assessment of Cuba’s potential to attract U.S. foreign direct investments outside the resource-seeking kind. It went on to offer some policy recommendations to overcome Cuba’s comparative disadvantage in attracting FDI. Those recommendations were supported by our understanding of how multinational firms will evaluate the decision to invest in Cuba in a post-Castro milieu as viewed through the theoretical lenses of International Business Studies. The second section began by noting that for a post- Castro Cuban transition government seeking to attract U.S. FDI, Cuban-Americans represent a hidden advantage and an opportunity to turn failure into success—an ace in the hole. It argues that the Cuban- American community, in various forms and ways, represents a comparative advantage for the island and a competitive advantage for those U.S. firms employing Cuban-American executives. It identifies, with the term geomanagement, the strategic relationship between geography-based comparative advantages and managerially-based competitive advantages. I have also sought to provide U.S. policymakers with a cognitive framework and with recommendations for policy formulations that go beyond trade policy incentives and aspire to foment a competitive urgency and a compelling competitive necessity for U.S. companies to invest in post-Castro Cuba by rewarding first movers with substantial and sustainable competitive advantages. Given the expected modular and unpredictable nature of the transition, U.S. policymakers will also need to consider carefully the timing of any relaxation of the embargo provisions. On the one hand, it is essential to retain some leverage mechanism to influence a post-Castro transition government on the path to the desired end-state of a fully democratic and market oriented Cuba. On the other hand, it is important to allow American firms the opportunity to benefit from a first-mover FDI commitment. Similarly, a future Cuban transition government must employ the conceptual sophistication to recognize that the exceptional skills-sets of the Cuban-American community can be pivotal for the island’s economic reconstruction. It would be well advised to view Cuban- Americans as first-movers, and to formulate policies to rationally overcome the negative country-specific factors that will otherwise limit FDI in Cuba to the resource seeking genre. There may indeed be some economic opportunism at play, but many successful entrepreneurs and executives in the Cuban-American community also feel dutybound to contribute whatever skills they may possess to the reconstruction of their homeland. Cubans residing on the island need not, and should not, go at it alone. 1. A shorter version of this work was published in Cuban Affairs (Quarterly Electronic Journal) Vol. 3, Issue 1, January 2008. 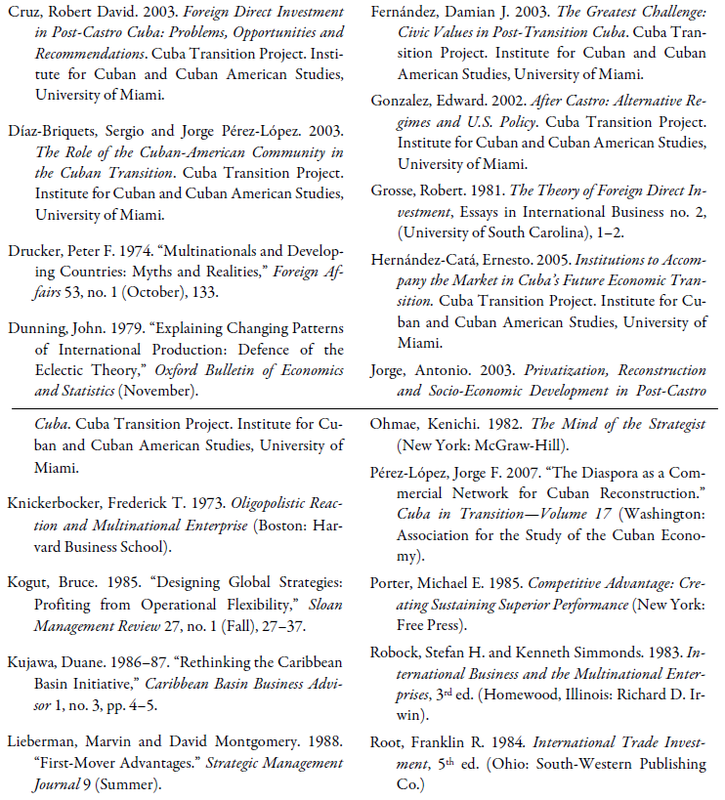 An executive summary version was published in Focus on Cuba, Cuba Transition Project, Issue 91, January 22, 2008. 2. In the case of Cuba, it should be noted that even exporting presents significant businesses risk since the country has a history of not paying supplier credits. Current U.S. legislation permits the export of certain products to Cuba but only on a cash basis. Clearly the risk of cash sales is lower than those on credit. 3. The AIB evolved from contacts among a few professors in traditionally distinctive fields—accounting, economics, finance, management, and marketing—who found they had common interests in studies concerned with international business. These academicians observed a gap in the existing spectrum of professional societies that separated academicians according to the traditional fields. The search for a medium of communication to fill the gap led to the formation of AIB in 1959. 4. The argument for FDI based on technical and scientific skills available on the island could also be framed as a form of resource-seeking investment. 5. The adage is usually attributed to social psychologist Kurt Lewin. 8. The idea of creating an environment of competitive urgency is based on the literature on competitive advantage, particularly the works of Porter, Ohmae, and Kogut. 9. These definitional comments on strategy are found in Ohmae 1982, 36–37. 11. Robock and Simmonds (1983) use the term “geobusiness model” to describe a similar set of relationships among conditioning, motivation, and control variables. 12. I am indebted to Jorge Pérez-López who pointed me to some relevant work and who shared with me a draft of his “The Diaspora as a Commercial Network for Cuban Reconstruction” (Pérez-López 2007). 13. The emphasis is mine. 14. This point is made by Root (1984, pp. 460–461). 15. I owe this point to my brother Jorge Azel, an astute observer of international affairs. José Azel, Ph.D., is a Senior Scholar at the Institute for Cuban and Cuban-American Studies, University of Miami, and the author of the book Mañana in Cuba.